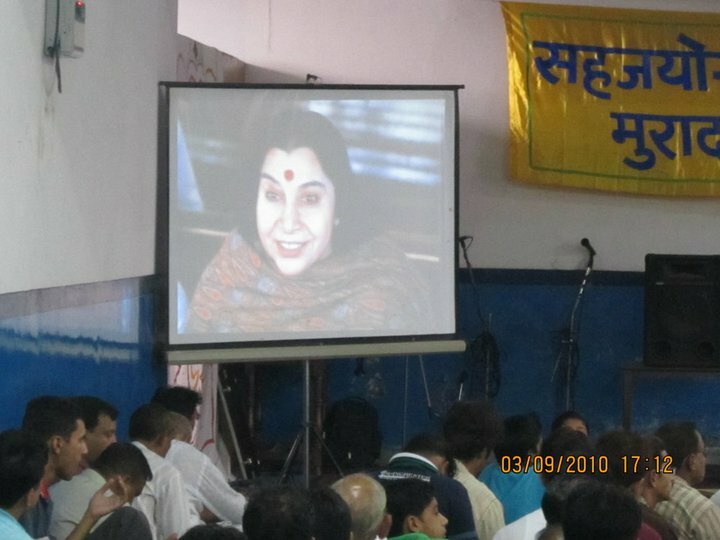 By the Grace of Param Pujya Shri Mataji a one day Sahaja Yoga Meditation Workshop was organised by the Moradabad collectivity on Sunday, 26th June 2011 at PMS Public school, civil lines with the help of Sahaji brothers and sisters from Delhi. It was attended by around 900 yogis and yoginis from Moradabad, Lucknow, Rudrapur, Bareily, Delhi and other places. said that SHE would with us in an instant with all HER powers whenever we remember HER from our heart with complete bhakti and shradha but only condition is that we must belong to HER i.e. completely surrendered to HER. As soon as this clip was played everyone started getting into meditative state and slowly started feeling cool vibrations. 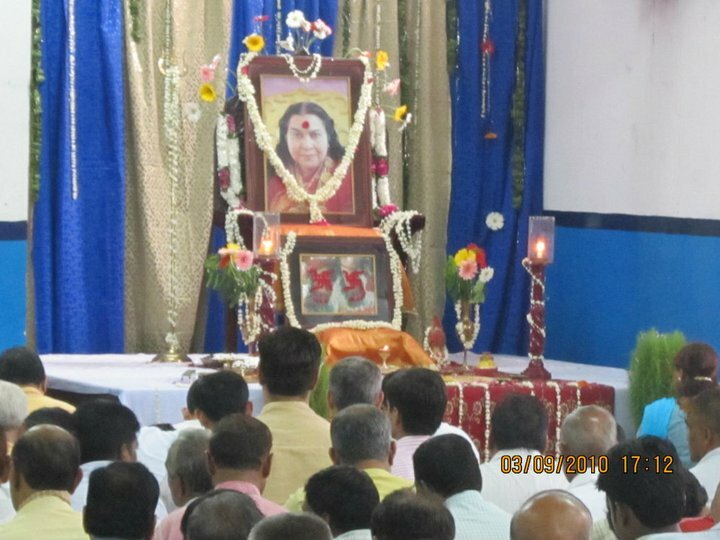 Spontaneously as the vibrations guided ; more audio clips of Shri Mataji were played on effortlessly surrendering at HER lotus feet to receive from Shri Mataji the blissful blessings of Thoughtlessness- Nirvicharita. Collectively everyone started feeling this joyous state of being in Meditation at the Lotus feet of Mother without any thoughts and in complete peace as the session progressed further with some stutis offered to DEVI in HER praise and glory. Everyone was so deeply enjoying the meditation that Lunch which was scheduled to be taken at around 1 p.m. was delayed to 2.30 pm when it was decided to have a break for 1 hour for lunch prepared and served by a devoted and energetic Moradabad collectivity bubbling with love and joy. Post Lunch session started with clearance of all the chakras and nadis by spreading left hand towards the Photograph and keeping right hand on different Chakras one by one starting from Mooladhara. 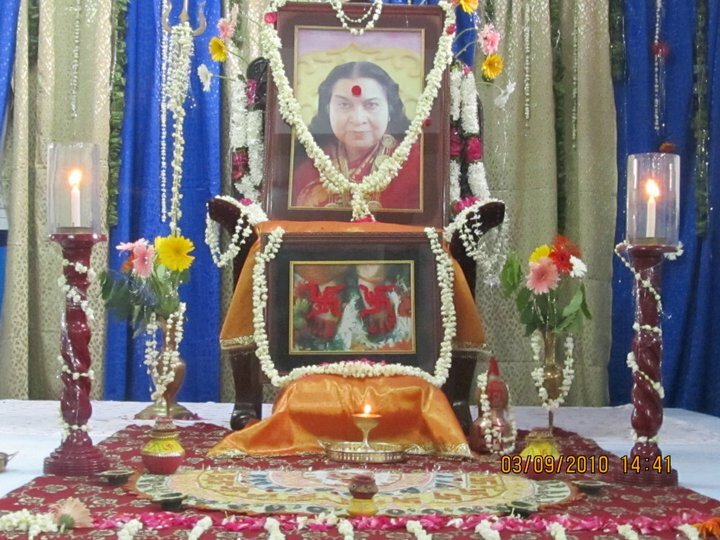 It was beautifully experienced by everyone that Shri Mataji cures all blockages and badhas of our chakras/nadis when we earnestly pray to HER and keep our attention surrendered to HER rather than on our problems or chakras or techniques etc. This was followed by another experience of how we can surrender our collective and personal problems at the lotus feet of the divine and leaving solutions tp HER without any expectations or conditions. As soon as collectively everyone prayed and left individual problems to Shri Mataji the vibrations flow increased tremendously and thoughtlessness was absolute. 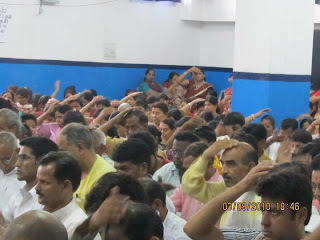 In the end Yuva shakti was called in front of the alter and everyone gave vibrations to then and collectively prayed to Shri Mataji by keeping left hand towards the photograph and the other hand towards the persons sitting before the alter. The program ended at around 5 pm with Aarti. Everyone was feeling the lightness of inner being and a state of blissful joy after such an intense workshop by the Grace of Param Pujya Shri Mataji our Guru and beloved Mother. We all bow down before HER. 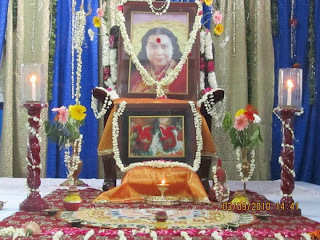 Jai Shri Mataji. BY THE GRACE OF SRIMATAJI, A MEDITATION WORKSHOP WILL BE CONDUCTED ON 26th JUNE 2011, BY SAHAJYOGIS/YOGINIS FROM DELHI. IT IS A FULL DAY PROGRAMME IN WHICH VARIOUS ASPECTS OF MEDITATION WILL BE COVERED. HOWEVER THE PROGRAMME WILL BE SPONTANEOUS & TAKE ITS OWN COURSE AS PER THE DIVINE INSPIRATION. PLEASE GRACE THE OCCASION BY YOUR PRESENCE.